I have a sago palm that is overtaking my living room. Is there any way I can prune the good stems to make it shorter? 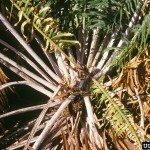 Generally, it is advised to only remove dead or damaged fronds, and not to shorten fronds, so the best option might actually be finding the plant a new home. If this is not possible, you may be able to remove a few of the longest fronds, following the advice in the article.